The full-color graphic novel debut from Noelle Stevenson, based on her beloved and critically acclaimed web comic. 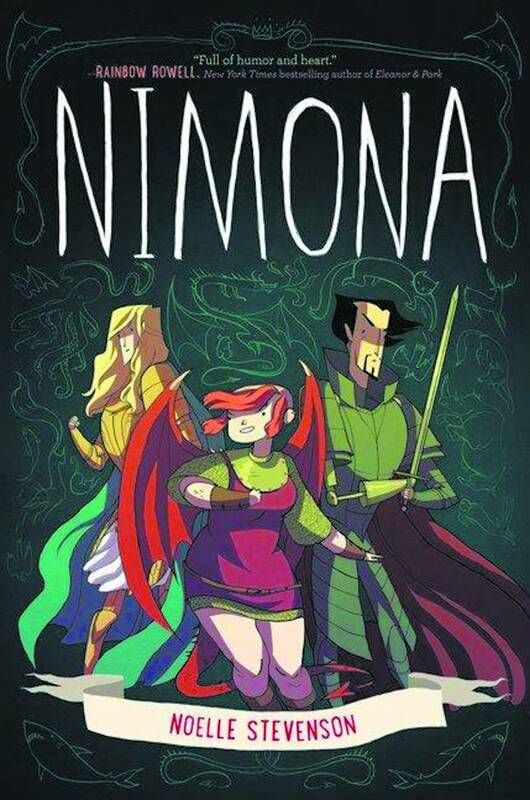 Nimona is an impulsive young shape-shifter with a knack for villainy. Lord Ballister Blackheart is a villain with a vendetta. As sidekick and supervillain, Nimona and Lord Blackheart are about to wreak some serious havoc. Their mission: prove to the kingdom that Sir Ambrosius Goldenloin and his buddies at the Institution of Law Enforcement and Heroics aren't the heroes everyone thinks they are. But as small acts of mischief escalate into a vicious battle, Lord Blackheart realizes that Nimona's powers are as murky and mysterious as her past. And her unpredictable wild side might be more dangerous than he is willing to admit.